Today, I’d like to share a simple pattern with you for an easy knit scarf that’s perfect to wear in warmer weather. Of course, it could be used in the winter too, but the open stitch-work makes it suitable for spring and summer. 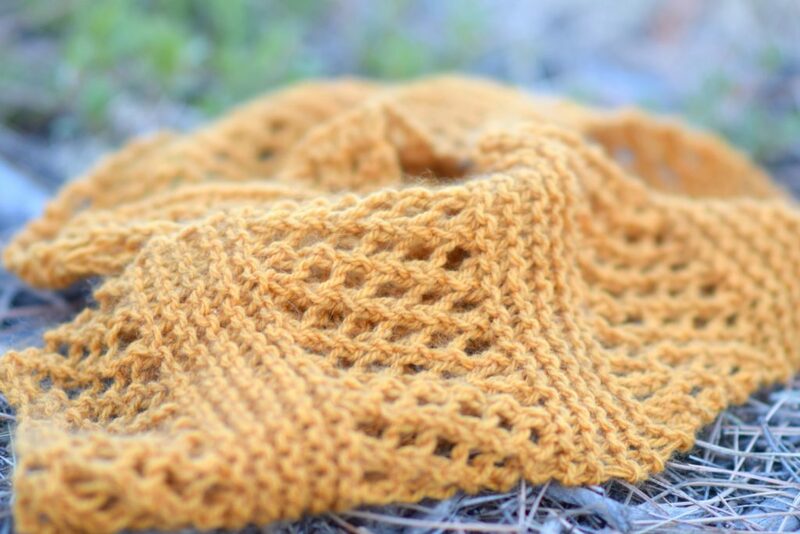 The mesh that is created in this project is a favorite of mine as it’s really easy to knit and it creates a really beautiful texture, don’t you think? 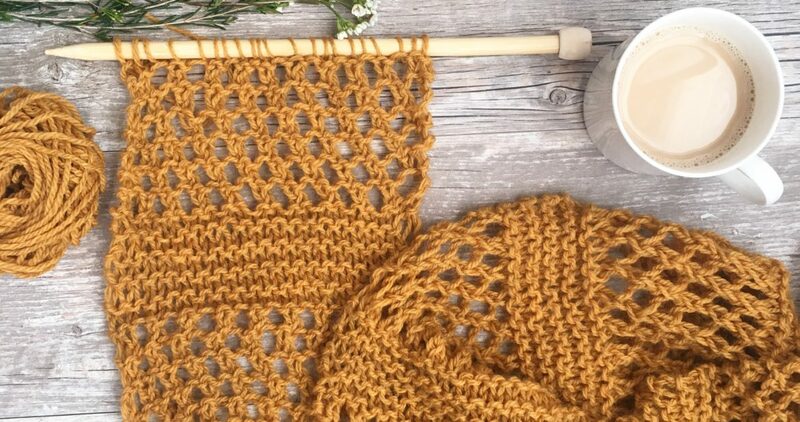 It reminds me of the look of honeycombs and the color of the yarn also reminds me a bit of honey, hence the name “Honeycombs Summer Scarf”. 🙂 The other nice thing about this project is that it doesn’t use a whole lot of yarn. Most of us have some extra worsted weight yarn laying around and this is a great stash buster! Scroll down to see the free pattern below, or you can purchase an ad-free, printable version from my Etsy Shop here. The yarn that I used in this pattern is “Merino Yak Alpaca Yarn” by Lion Brand Yarn (here). It’s one of their luxury yarns and this was the first time I had ever used it. It landed in my bag during my trip to New York City earlier this year and I couldn’t wait to try it out. It’s always fun to try unique, new yarns and this one was a lot of fun! If you’ve never tried Yak, I found it to be quite similar to the feel of wool and it has a lovely high end look. As I mentioned, I wanted to use my new “Yak” yarn for this scarf. It’s a warm, wool like yarn, so if you’re going for a lighter weight version I’d consider using a cotton yarn or cotton blend. The Lion Brand 24/7 Cotton is a great mercerized option (here). I also am in love with their new Feels Like Butta yarn (here), which is one of the all time sofest, chenille yarns that I’ve ever felt. 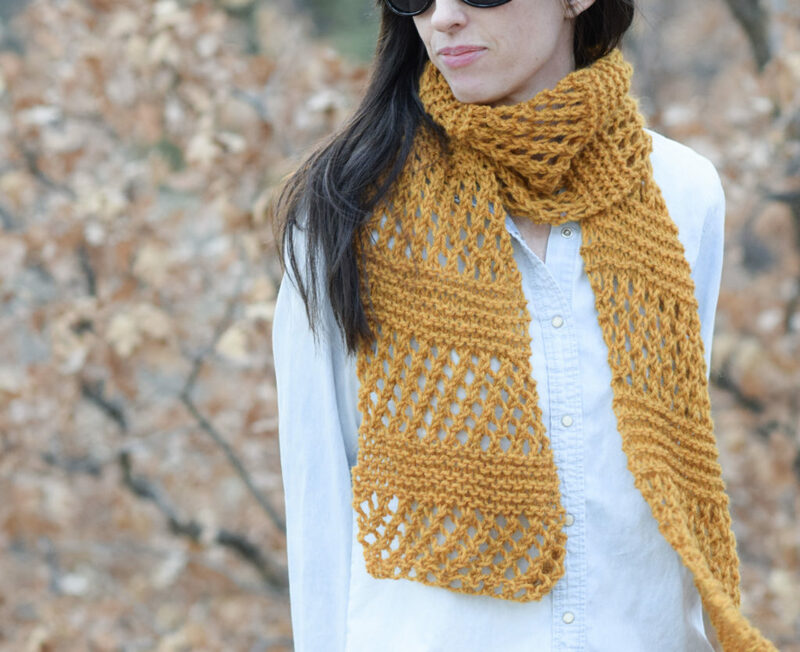 Pattern Description: A simple yet beautiful knit scarf that’s suitable for any time of year. Notes: This scarf is knit by alternating a simple open mesh stitch pattern with simple garter stitch sections. You can easily modify the pattern to make the scarf shorter or longer. Row 2: (WS) K1, *yo, k2tog; repeat from * across the row. Row 4 K2, *yo, k2tog; repeat from * across the row to last st, knit 1. Repeat rows1-4 for approximately 4”, ending on row 4. Next, you will knit the garter stitch section. Repeat entire pattern, alternating the Mesh “Honeycomb” Section (Mesh Section begins on a RS row throughout pattern) and the Garter Stitch Section until piece measures approximately 65” long, ending with a Mesh “Honeycomb” Section. Now enjoy your new scarf! I hope you liked this pattern my friends. Let me know if you try it out! Thank you to Lion Brand Yarn for providing the yarn for this pattern! IF You wanted to make the honeycombs scarf wider is it odd or even stitches multiple? Hi Jodi! Keep it an odd stitch multiple. I love the new scarf. It is my next project. Hello, Thank goodness at last a knitting pattern that uses good old straight needles! Lol. Will definitely be making this. Hi Christine! Gotta love good ol’ straight needles. Enjoy! Hi Laurie! Yes I think 8s would be nice and you can always adjust depending on how it looks. Also, it will turn out a little thinner with the thinner needles and yarn so you might want to cast in more stitches keeping and odd stitch count. Hope you enjoy! Thanks! I cast on 35 with size 8 needles. Looks good so far! Hi Heather! I’m so honored and thank you so much for your kind words on your blog about my patterns! It means so much to me! I really hope you enjoy this one. 🙂 Congrats as well on starting a blog!! Another winner! Love your easy to follow patterns. I love the look of this scarf – I decided I was going to make it but double the width so it could also be used over the shoulders. I bought some lovely yarn and set out to find a project bag to get going. I then realized that out of 4 project bags, they were all in use with projects in varying stages of completeness. My first instinct was to sew another project bag, but I probably should just finish one of the incomplete projects. Anyway, it led me to question – how many “ongoing” projects is normal?? I don’t have any knitting friends so I am wondering – how many do YOU have?? Oh good! I’m happy to hear this is not unusual In the end, I dug up an empty basket and decided that would work. I love Lion Brand yarn but couldn’t find the type you suggest in my local (Canadian) stores so I am using a baby alpaca and Merino blow yarn that is so soft. I’m making it wide for a shawl and I love it so far. It’s going to be the perfect air conditioner buster for in the office or stores this summer! Thanks for another pretty and easy pattern! This is a beautiful pattern! I lead the prayer shawl ministry at my church and I am envisioning this pattern in a shawl — live in Houston, so nice for this type of weather. That would be lovely especially for the warmer weather there in Houston. Thank you for tour kindness with that ministry! 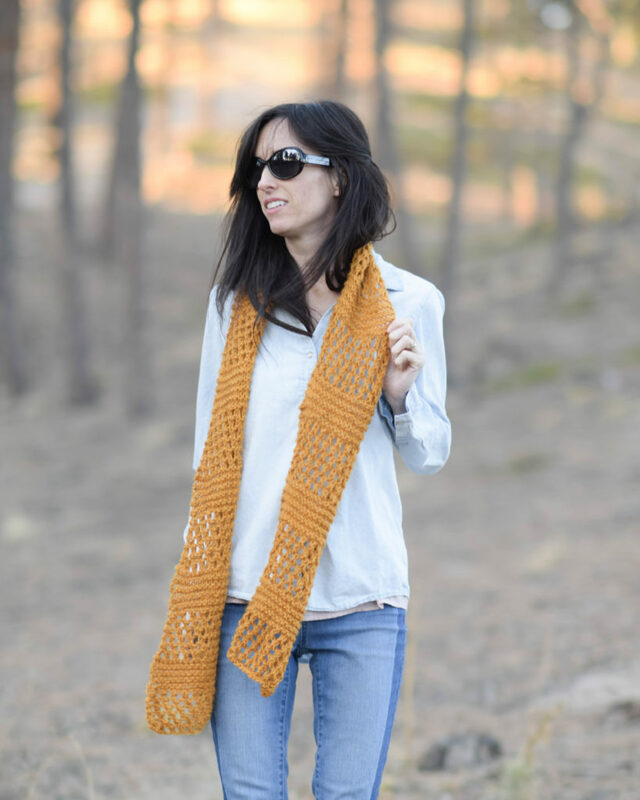 Jessica, Want to make the honeycomb summer scarf. I have ripped it out and started over 7 times. My problem: Every row is one st. short or one st. long. I have counted, I have ripped out one st. at a time to find what I am doing . So is there a trick to this I am missing. I like the pattern and I do want to make it. I am just not seeing what and where the problem is. Hi Evelyn….Have you tried watching the video? You might want to try casting on fewer stitches (even exactly how many I cast on in the video) and following exactly what I do (pausing and rewinding when needed) you might catch why its happening. Hope you can figure it out! Hi – this same thing happen to me. I ripped it out 4 times. Then as Jessica suggested I watched and watched her video. Then I figured out my issue. It was the way I was doing the YO. To be sure, I watched other YO teaching videos online and sure enough that was it. I am well into knitting this beautiful scarf. I hope this helps you. This is so pretty! Would you consider doing a shawl pattern using this pattern? Would you still use the suggested yarn which is beautiful by the way! I love this pattern, this scarf will be perfect for spring/summer! I’m using cotton. I love your blog and the patterns you share, thank you!! A very big compliment from Holland!! Really love your blog and the things you make. Now making the Honeycomb scarf for a friend. And making one for myself. Love the color!! Thank you so much for sharing this pattern! I loved trying out the honeycomb mesh knit. The only thing I found after finished was that all the honeycomb section hang really wonky – has anyone else found this? For those sections I was following the pattern (Row 1: knitting one, yarn over, knitting two together, Row 2: knitting all and Row 3: knitting two, yarn over, knitting two together, Row 4: knitting all). Is there another way of starting a row that makes it less wonky? I made another scarf in this style but just did 2 sections of honeycombing so that ‘the wonk’ was less noticeable. Hi Lucy! Are you referring to the way the honeycomb is slightly diagonal or was something else happening? That’s the only thing that I can think of – you can see what I mean in the photo where I have the scarf hanging. Thanks so much for this lovely pattern! This is my first mesh pattern and I really enjoy knitting this! Can’t wait to share it with you – my biggest inspiration! Hi! I’m a little new here. I just started experimenting with knitting this project and I’ve run into a little trouble. Just to set the stage so to speak, if I have the project on the left needle and I am looking at the right side of the project, the left hand side stitches of the honeycomb are all quite lose and wonky, while going farther across the project to the right the stitches get tighter and cleaner. Is there anything in particular anyone thinks I’m doing wrong or any way to fix this in this stitch? Thank you so much! Oh I love this scarf. I will have to make it just need to get some yarn.Thanks for sharing your beautiful work. You’re welcome Linda! So glad you like it! I am just finishing the Honeycombs Summer Scarf in the recommended Merino Yak Alpaca yarn. It is lovely and very light. Drapes beautifully. Do you suggest blocking or steam pressing the finished scarf so it looks a bit smoother? It is a gift so I want it to be really nicely finished. Thank you! Bonjour et merci pour toute les explications J’adore le model Honey-combs. Je vous souhaite un très bel été et à tout bientôt. Love both items. Think I will start with the honeycomb scarf. Thanks for sharing your beautiful works and sharing them with all of us. Look forward to many more. 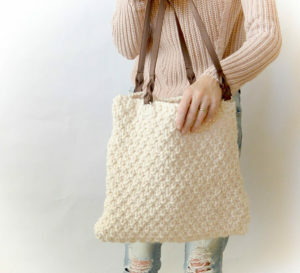 I love this knit pattern and love this blog page!! Wondering if I was to make this into a larger shawl or blanket would I just need to make sure that the cast on was an odd number?? Any help would be appreciated!!! Thank you so much for what you do! I am a “baby” knitter and am so grateful for these blogs that share all their wisdom cause no one I know knits!!! I love this scarf. Thank you for sharing. I’m a new knitter and I can’t figure out which side is the WS and which is the RS in order to start my next honeycomb section. Is there a trick?